It delves without compromise into the hungers that lie deep within us all! A searching look into the innermost depths of a woman's heart...and a man's desires! "...maybe it's better for both of us to leave each other alone." Writer/producer/director Robert Rossen, also known for his earlier contributions to the screenplays of The Roaring Twenties (1939) and The Treasure of the Sierra Madre (1948), Body and Soul (1947), Best Picture winner All the King's Men (1949), and his last film Lilith (1964), based this harsh, poignant, intensely dramatic film (with co-writer Sydney Carroll), a morality play, upon the novel of the same name by Walter Tevis. Rossen's shattering experience of naming names in the 1950s HUAC hearings (after being blacklisted and then recanting two years later) influenced his writing for this film - the low-life, bruised film hero is both self-hating and cowardly. Paul Newman in the lead role (in arguably his penultimate and accomplished screen appearance) as a brash, contending pool hustler ("They called him 'Fast Eddie'") became a leading man with this film, but he was wrongly denied his first Oscar - although twenty-five years later, the Academy honored Newman with his first (and sole) Best Acting Award for reprising the role in director Martin Scorsese's sequel, The Color of Money (1986). The self-conscious movie, filmed in black and white - and Cinemascope, received a total of nine Academy Award nominations (with only two wins). There were four acting categories: Best Actor (Paul Newman - his second nomination), Best Actress (Piper Laurie), Best Supporting Actor (television comedian Jackie Gleason), and Best Supporting Actor (George C. Scott in his third screen appearance, and his second supporting nomination after his first nomination received in 1960 for Anatomy of a Murder (1959)), a nomination for Best Picture (that it lost to West Side Story (1961)), and nominations for Best Director and Best Screenplay. Out of its nine nominations, the exceptional film won only two Academy Awards: Best Cinematography (for veteran German cinematographer Eugene Schufftan) and Best Art Direction. George C. Scott became the first actor to decline his Oscar nomination for the film - in protest of fellow actors' practice of campaigning for awards, calling the awards demeaning and self-serving. Expert pocket billiards champ Willie Mosconi, listed in the credits as Technical Advisor, provided some of the trick pool shots for Newman - Jackie Gleason shot his own games. Vincent Gardenia and Jake LaMotta (the Raging Bull boxer) appear in bit cameo roles as bartenders. 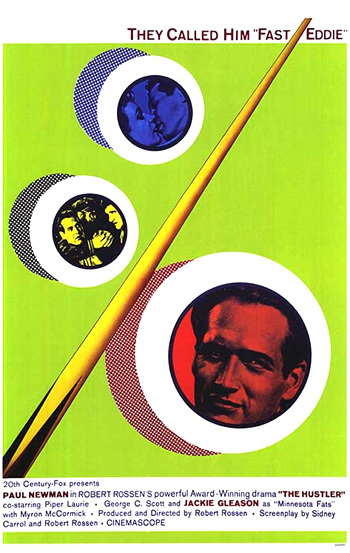 Before the credits, the film opens with existential anti-hero "Fast" Eddie Felson (Paul Newman) and his elderly manager Charlie Burns (Myron McCormick) entering a local pool hall - the Homestead Bar and Grill, located two or three hours drive from Pittsburgh. He is a pool hustler, posing as a traveling salesman, who enjoys his favorite drink - J.T.S. Brown bourbon - while playing and losing a mediocre game of pool with his buddy. As a cigarette dangles limply from his lips, tricky Eddie feigns poor shooting and drunkenness as a "lucky lush" to lure other hotshot players/marks into betting against him. When he makes an almost-impossible shot ("you couldn't make that shot again in a million years"), he repeats the spectacular shot with higher stakes, and misses. The bartender (Vincent Gardenia) and other patrons see an opportunity to win and they enter the contest ("I'll try you"), challenging the pool player to another attempt and matching his $105 dollar bet ("one week's commission") - they fail to notice that they are being conned and swindled. Eddie: Yeah, like a church. Church of the Good Hustler. Burns: It looks more like a morgue to me. Those tables are the slabs they lay the stiffs (on). Eddie: I'll be alive when I get out, Charlie. The cashier/pool hall manager emphasizes the main attraction of the renowned joint: "No bar, no pinball machines, no bowling alleys, just pool, nothing else. This is Ames, Mister." Felson sizes up a table, its cushions, surface, and drop pockets. [A poster tacked on the wall behind Charlie advertises a pool exhibition featuring WILLIE MOSCONI - "Co-Holder World's Best Game."] As he chalks the end of his cue, Felson rhetorically bemuses: "How much am I gonna win tonight? Ten grand, I'm gonna win ten grand in one night. Well, who's gonna beat me?...I mean, what other pool room is there in the country where a guy can walk out with ten grand in one night?" One of the bystanders/hoods, who knows Eddie's hustling reputation and anticipates his impatient desire to shoot "straight pool...the expensive kind" with the unbeatable acknowledged master "Minnesota Fats" (Jackie Gleason), advises Charlie (derisively labeling him as Eddie's "manager, his friend, his stooge") to forget about winning: "Take your boy and go home. Fats don't need your money. There's no way you can beat him. Nobody's beat him in fifteen years. He's the best in the country." Unheeding the warning, the two play pool and wait for the prompt arrival of Fats at 8 pm: "He comes in this pool room every night at 8 o'clock on the nose. Just stay where you are. He'll find you." Fats: Do you like to gamble, Eddie? Gamble money on pool games? Eddie: Fats, let's you and I shoot a game of straight pool. Eddie: Well, you shoot big-time pool, Fats. I mean, that's what everybody says, 'You shoot big-time pool.' Let's make it two hundred dollars a game. Fats: Now I know why they call you 'Fast' Eddie. Eddie, you talk my kind of talk. Eddie: Didn't leave you much. He is great! Geez, that old Fat Man. Look at the way he moves, like a dancer...And those fingers, them chubby fingers. And that stroke, it's like he's uh, like he's playin' a violin or somethin'. At midnight, the game proceeds between the two virtuoso players, shown in a montage of sideviews of intent onlookers, called-shots, the clicking sounds of the shiny balls, scorekeeping (by Alexander Rose), and wagered wads of bills - deceptively calm, Fats appears to be winning. Charlie cautions Eddie at 1:30 am: "Quit, he's too good." Eddie is confident that he can beat the famous player in the cut-throat game: "Charlie, I'm gonna take him." Eddie: Well, you don't leave much when you miss, do ya Fat Man? Fats: That's what the game's all about. As he shoots and the night progresses, the tide turns in Eddie's favor and he boasts: "You know, I gotta hunch, Fat Man. I've gotta hunch it's me from here-on in...I mean, did that ever happen to you? When all of a sudden, you feel like you can't miss? 'Cause I dreamed about this game, Fat Man. And I dreamed about this game every night on the road...You know, this is my table, man, I own it..." By four am, Eddie is ahead "approximately one thousand bucks." At that point, Eddie raises the wager to a thousand dollars a game - and mimics Fats in his drink order to the Preacher (Stefan Gierasch) by asking for his favorite bourbon. In a parallel move, they both strip off their outer coats for the real match. On his return to the game, the Preacher notifies the shrewd, expensively-dressed, big-time gambler Bert Gordon (George C. Scott), whose drink of choice at a poker game is milk, of the hustler in town. Gordon, who is Fats' backer and bankrolls his games, watches soundlessly from the sidelines and pays up when Fats loses. Eddie: The pool game is over when Fats says it's over...I came after him and I'm gonna get him. I'm goin' with him all the way. The pool game is not over until Minnesota Fats says it's over. Is it over, Fats? (Fats turns to Gordon for the answer.) (To Gordon) I'm gonna beat him, Mister. I beat him all night and I'm gonna beat him all day. I'm, I'm the best you ever seen, Fats. I'm the best there is. Now even if you beat me, I'm still the best. Gordon: (To Fats) Stay with this kid. He's a loser. Eddie: (To Charlie) What did he say? Fats: Fast Eddie, let's play some pool. Charlie: What are ya tryin' to do Eddie? Beat him? You beat him bad. Do you want to kill yourself? Eddie: What are ya, chicken, Charlie? Charlie: Yeah, maybe that's it, I'm chicken. Letting his ego overtake the better part of his judgment, Eddie reprimands his long-time partner. Charlie reluctantly hands over their betting cash: "OK. Here, be a damn fool." Disheveled, exhausted and drunk, Eddie puts on his coat - his collar is unattractively folded up - a sharp contrast to the professional-looking slickness of his opponent: "You really look beautiful, Fats." Eventually in the game, Fats gains the upper-hand and there's only a few hundred dollars left of Eddie's original bankroll in his pocket. The victorious champion declares the match over: "Game's over, Eddie." Fats places his stake money, a percentage of his winnings, into the hand of his dark glasses-wearing sponsor Gordon, sitting on a barstool. When the blinds are opened, the light sears Eddie's eyes, exposing his defeat, and he winces in pain. He piteously begs for a continuation of the game, but collapses: "Fats, Come on. Come on. Hey, Fats." The next morning, Eddie is woken up and reminded of his monumental destruction in the pool hall. His confidence shattered, he stirs with the sound of an opening pool break in a flea-bitten hotel room (across the street from Ames Billiards) which he shares with Charlie. Eddie decides to desert his manager and hustle on his own: "I'm sorry, Charlie," he whispers as he leaves. In a bus station in the dead hours of the early morning, with his only possessions - a suitcase, cue case and garment bag, he enters a rest room, containing a horoscope machine, asking: "Is This Your Lucky Day?" After shaving, he deposits and locks his entire life's savings into a bus locker. In the station's cafe, he sits down at a table next to a forlorn traveler [later revealed as Sarah Packard (Piper Laurie)], who is supposedly waiting for an 8 o'clock bus, without enough time to get better acquainted with him: "That wouldn't give us much time, would it?" He toasts her with a cup of coffee: "Hello and goodbye. Have a nice trip." Sarah: I know where you live. In a locker in the bus station. What's it like living in a locker? Eddie: Cramped. Do you always drink like this so early in the morning? Sarah: The name should be Eddie. What should my name be? Eddie: I don't know. Whatever you'd like it to be? Sarah: I'd like it to be what it is, Sarah. That's a Biblical name. You wanna know it's meaning? Why me? (Without answering, he hungrily kisses her. She pushes him back.) Please, please, you're too hungry. Enigmatically, she rejects him and turns away - for the time being. He rents a slummy apartment for a buck and a half a night, retrieves his belongings from the bus locker, and buys another fifth of alcohol for himself. Thinking that he can hustle alone at a local bar and pool hall, he is immediately recognized as Eddie Felson - an expert: "Oh man, you're way out of our league." At another bar, he does succeed in pretending to be a "lucky" novice and cons some players into losing: "You shoot good, but you also shoot lucky."